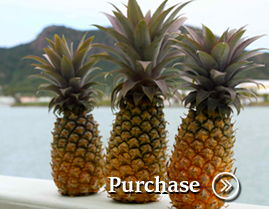 Hawaii Pineapples - Fresh Tropical Gold Pineapple shipping to your Oahu Waikiki Hotel or to the Mainland. NO HOTEL DELIVERY ON SATURDAYS OR SUNDAYS. Hawaii Pineapples - Tropical Gold Pineapples DELIVERED to your Waikiki hotel the day you depart or you can choose to have them shipped to your home. Cases for check-in comply with luggage dimensions for easy check-in. Each case weighs approximately 27 pounds and contains 6 – 8 Tropical Gold pineapples. Carry-on packs contain 2 - 3 pineapples and weigh approximately 10 pounds. Papayas also available for hotel delivery or shipping. A 10lb case contains 8-11 Solo papayas. If you're on Oahu, our certified boxes of Pineapples are guaranteed FREE check-in luggage! Call us today at 866-482-9775 or just order online! Note: We only deliver to hotels in Waikiki. See our top reasons to have these Hawaiian pineapples delivered to your hotel so you can take them home with you when you depart Hawaii! All airlines allow pineapples as free check-in luggage with the exception of US Airways, who now charges standard baggage rates. Our Hawaii Pineapples are Airport ready. They are already securely boxed up for you. 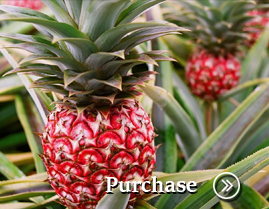 Our Hawaiian pineapple is inspected and pre-certified. FREE delivery to your hotel the day you leave! Pineapples from Hawaii make great gifts for your friends and loved ones. Tropical Gold pineapples are the best pineapples in the world. You do not get these at your local grocery store. These are direct from Oahu. 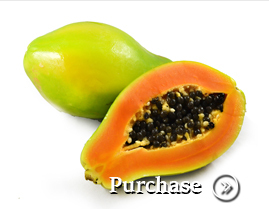 We also deliver and ship fresh Papayas! This is a great way to enjoy Hawaii when you are back on the Mainland with your friends and family. If you want to ship pineapples to the Mainland, we use UPS 2-3 day delivery to the mainland, but if you are in Hawaii, bring back your own and save! Our Hawaiian pineapples are known as Tropical Gold pineapples and are grown on the north shore of Oahu, and the pineapples are shipped to the mainland direct from Hawaii. No matter what time of the year it is, fresh pineapples are a welcome and tasty treat. Hotel delivery orders must be received by 11:00 AM – the day prior to departure date. Any order received later than the cut off time will incur an additional $10.00 rush fee. Orders are delivered to the hotel Bell Desk at least 1 hour prior to the hotel departure time which must be picked up at the time of departure from the hotel. For Hilton Hawaiian Village deliveries, please specify main lobby or Tapa Towers. If you are shipping, UPS Shipping is done on Monday, Tuesday & Wednesday only. Orders are shipped via UPS 2nd Day. (Monday shipments arrive Wednesday; Tuesday shipments arrive Thursday, Wednesday shipments arrive Friday) On occasion, shipments may arrive 1 day later. Shipping orders for Mondays must be received by 4:00pm the Friday prior. Shipping orders for Tuesdays must be received by 4:00pm on Mondays. Any orders received on Tuesday will be sent the following Monday. Due to the pineapples perish ability no shipments to P O boxes or Alaska. SO, Order your Hawaiian pineapples before you go to Hawaii and have a great way to show the spirit of Aloha when you arrive back home! Your shopping for Hawaiian gifts is already done! Call us with any questions at 866-482-9775 and be sure to check out our sister sites like www.hawaiidiscount.com for other great Hawaii activities and Hawaii tours.